Eric Javits Luxury Designer Women's Fashion Handbag – Lil' Leigh – Black | Accessorising - Brand Name / Designer Handbags For Carry & Wear... Share If You Care! 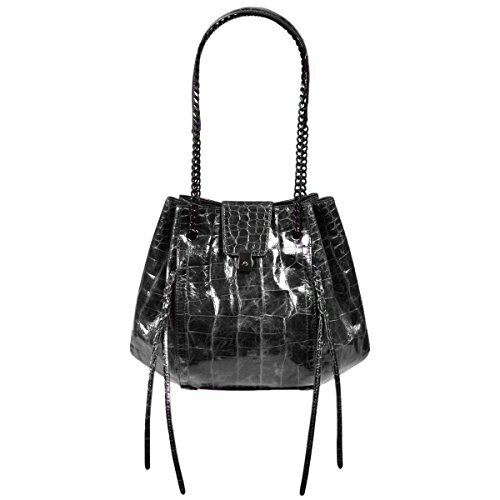 Croc embossed leather mid-size bucket hobo is functional and sleek. Pull chain accordion construction opens wide to permit easy access. Top placket lock closure secures contents with a simple “click”. Discreet hardware allows the richness of the polished leather to prevail. Chain should strap (10″ drop) extends in order to wear the bag at cross body length (19″ drop). Convenient front outer zip compartment is ideal for sunglasses or smart phone. Bottom has protective metal feet. Inside: Water repellent lining of micro suede combined with poly canvas is sumptuous, durable and easy to clean; dual front and back zipper compartments are convenient to hold all essentials. Two additional patch pockets will hold eyeglasses and a phone. Key clip holder makes finding keys a cinch! All Eric Javits bags are lightweight and durable.